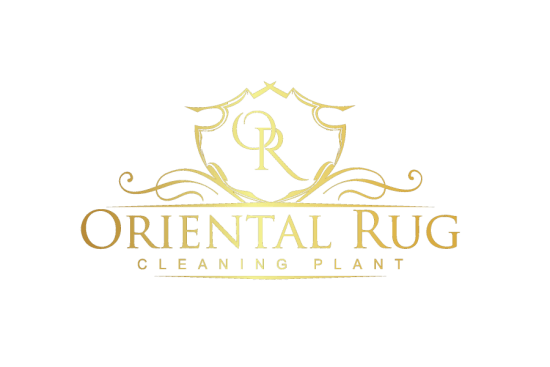 While we are all pet owners and pet lovers here at the Oriental Rug Cleaning Plant, we do know the headaches that a beloved pet can cause involving your in home area rugs. We have yet to be able to speak to our pets, or read their minds, so typically have to make educated guesses as to who they do what they do. There are a few theories out there as to why our dearly beloved pets find it necessary to urinate on our beautiful in home area rugs. The most commonly accepted reason also makes the most sense. The thought is that the pet is simply marking its territory. This is something that all living beings have been doing (in their own way) for as far back as history can trace. Pets can feel the need to mark their territory for a number of reasons. If the pet is moved into a new living space, it will typically take it upon itself to mark certain areas with urine to show that it is now that pets space, this can include any new area rugs, or any area rugs moved with you. If the space where the pet is located has any traces of other pets or past urine spots, the pet will feel inclined to urinate or spray on top of those areas to replace the present odor with their own. Old urine spots may not always be clearly noticeable to the average human, but the increased capacity for a pet’s odor identification leads them right to the affected area. This is more common on area rugs that are purchased in conditions that are not brand new. Another thought on why pets urinate on your in home area rugs is that they mistake it for a patch of grass. This idea seems to be quite plausible. 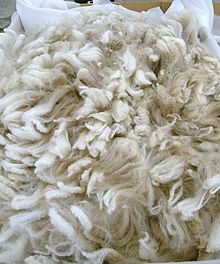 It is understandable that the fibers on an area rug can be mistaken by a pet to be grass, especially if the area rug is laid out on a hard surfaced floor. When a pet does urinate on your in home area rug, for whatever reason, it can be difficult to remove without the proper treatment. The reason it can be difficult to remove entirely is mostly due to what the pet urine consists of. When a pet urinates on your in home area rug, the urine itself contains Bacteria, Ammonia, Uric Acid and Various Hormones. This combination can make urine much more of a tough task to fully neutralize and remove than other types of spills that might occur on your in home area rug. During the process in which the urine breaks down as it settles into your in home area rug, the ammonia that resides within the urine begins to increase in concentration. As the increase in concentration grows, there are then organic chemical substances, which contain sulfur, that begin to produce themselves. These high in sulfur organic chemical substances are called Mercaptans. 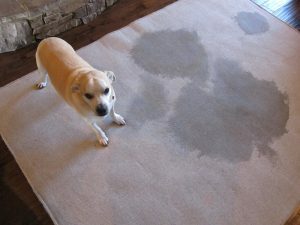 Mercaptans are what is to blame for the terrible odor that is left behind when a pet urinates on your in home area rug. Even if the mercaptans are thin and low in concentrate, they still produce a very strong odor that cannot be missed. The mercaptans found in your pet’s urine are the same natural chemicals that produce a very powerful odor that skunks emit when they feel threatened. I’m sure at one point in time we have all seen a skunk in action on television, or have at least heard stories of the terrible, immobilizing spray that a skunk can and will emit. Mercaptans are also a key part in the ever so terrible odor of some rotting vegetables. 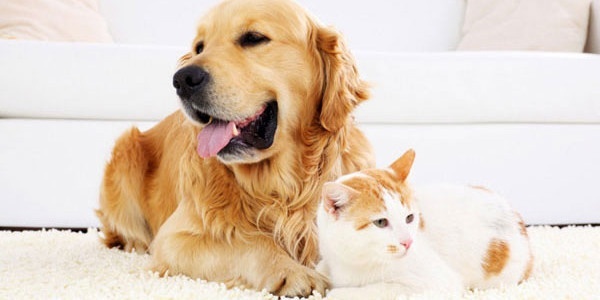 Due to the naturally occuring substances that come out along with the urine, there are particular solutions and methods required to neutralize and remove the odor and stain causing substances within the pet urine. If and when your beloved pet urinates on your in home area rug, you do want to treat it as soon as possible. The quicker you are able to treat and remove the urine, the better chance you have at preventing a heavy odor and possible permanent staining. Permanent staining occurs when serious damage is done to the fibers in the rug. 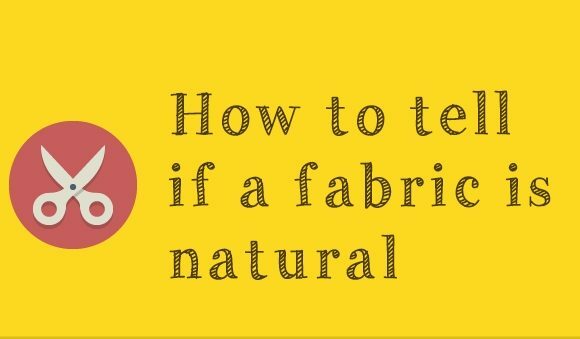 Whether natural or synthetic and even with a protective coating, the right kind of spill that is left unattended to for too long can absolutely cause permanent damage to any and all fibers that compose your in home area rug. While urine is not the most detrimental bodily fluid that your pet can emit onto your in home area rug, it can still be difficult to remove and can cause permanent damage. As soon as your pet urinates on your in home area rug, you will want to take a rag, towel or paper towels and begin to blot or dab the liquid urine up as much as possible. Make sure you are blotting and dabbing the urine up, as rubbing it will only pull some of the urine up, while forcing the rest deeper into the fibers of your in home area rug. 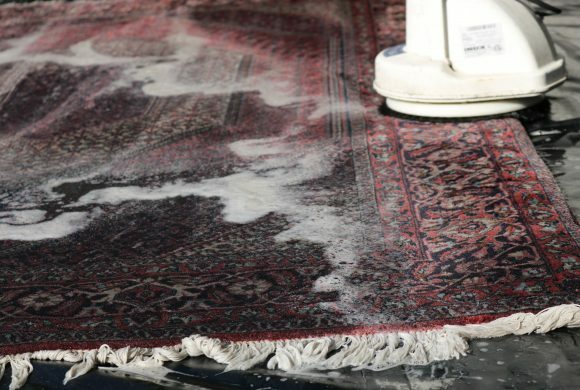 It may sound a bit extreme, but if you have a shop vac, or a wet dry vac, you can use this to remove the maximum amount of urine from your area rug, which could help to make the professional cleaning of the area rug more effective during urine treatment portion of the washing process. Once you have removed most of the liquid pet urine off of the area rug’s surface fibers, you can then begin to treat the area rug a bit more deeply. But, you must proceed with caution, as you do not want to be the reason that permanent damage is caused. The safest way to treat your in home area rug a bit more deeply prior to having your professional washing completed, is to mix warm water, dish soap and white vinegar into a bowl and use this mixture to try and clean up some of the urine that is sinking into the area rug a bit more deeply. After you have cleaned as much of the liquid urine up, off of the in home area rug and you have made your evenly mixed cleaning solution, you will want to slowly pour a little bit of the solution right on top of the urine affected portion of your area rug. Do not over saturate the area, pour what seems to be just enough to dilute out through the remaining urine. This mixture helps to neutralize some of the odor, while helping to kill some of the bacteria as well. This helps more so in preventing permanent staining of your in home area rug. After you apply the solution mixture to the urine affected area, you will want to blot or dab it off, just like you did during the initial step during this in home area rug treatment. Repeating this step 2 or 3 times may help to remove as much of the urine and what the urine leaves behind as possible. After you complete your in home urine treatment, you want to make sure that the treated area is properly dried completely. Believe it or not, proper drying of an area rug is one of the most important steps in the cleaning process. If an in home area rug is not dried properly, serious damage at the base of the area rug can occur. Whether the area rug is natural or synthetic, tufted or un tufted, wetness at the base of the rug for an extended period of time can cause mold, mildew or rot which can destroy your rug. The dark, damp atmosphere is perfect for small bugs as well. 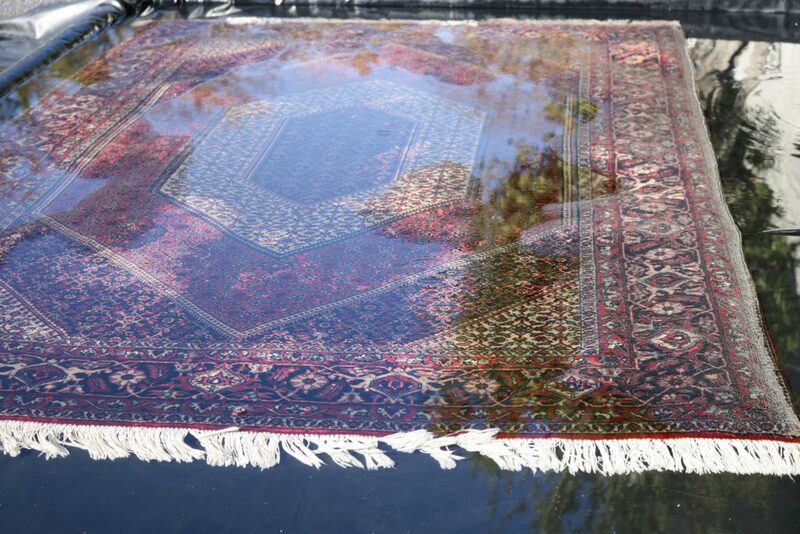 Bugs that will reproduce and or eat away at the base fibers as well as the pile fibers of your area rug will work their way into the wet areas and begin to cause their damage before you can even notice. You do want to have a professional urine extraction and washing service done as soon as possible once the pet has urinated on your in home area rug. That’s where we come in! 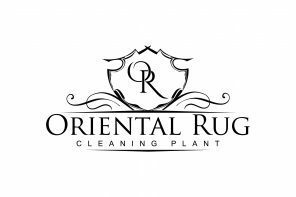 We will pick your nice, in home area rug up and bring it back to our full washing service rug facility for full and proper treatment. 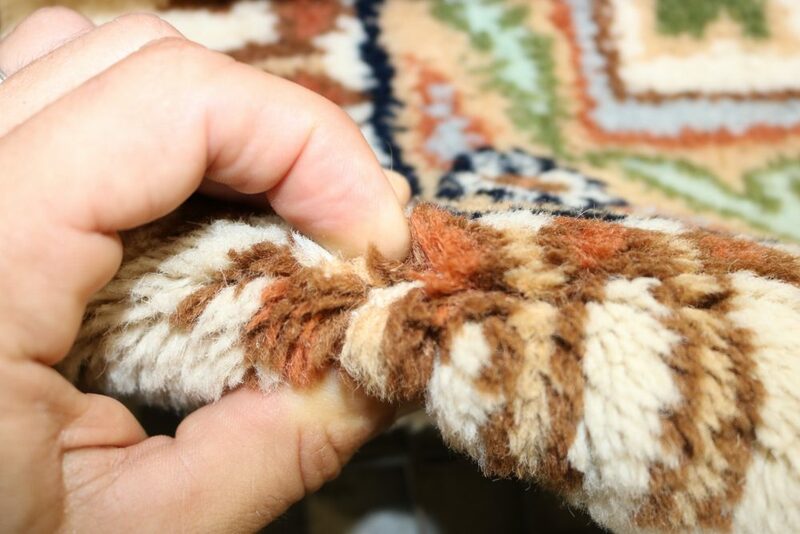 Once your area rug is in our facility, our professional rug technicians will perform a deep and thorough inspection. If there are any concerns at all during the inspection, a member of our friendly staff will call you to discuss and advise. Once we begin the washing process your rug will be thoroughly dusted prior to beginning the pre cleaning urine extraction. The urine extraction process is a full submersion process that involves flushing the area rug thoroughly, prior to submerging it in a special extraction bath. The bath is a custom tub that is full of a proper mixture of urine neutralizing solution and water, that work along with a flushing system that ensures the entire rug is completely and thoroughly flushed throughout. This is where the urine is neutralized, broken down and pulled completely from the rug. After the urine extraction is complete, the rug is then moved to the wash floor to complete the remainder of the immersion area rug washing process. The professional, in facility urine extraction method combined with our full immersion washing process is a highly effective area rug treatment that cannot be replicated in home. When the time comes, reach out to the pros and we will be happy to help! Rug Variety.We Clean More Than Rugs!